Margarine overtook butter because of it’s lower levels of saturated fats. 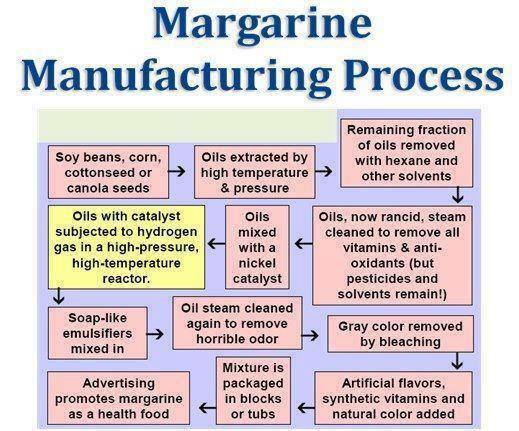 Problem is that margarine has adverse effects because of its hydrogenation process. The trans-fatty acids in margarine increase LDL cholesterol (the bad one), and lower the healthier HLD cholesterol. This raises the risk of heart disease. Heart disease, diabetes, and other killer diseases are all running rampant and at an all time high, thanks largely to hydrogenated and partially hydrogenated oils that are used to provide a long shelf life to commercially prepared baked goods, crackers, cookies, frozen prepared foods, etc. In order to make margarine the vegetable oils need to go through a process called hydrogenation. Hydrogenation is the process of forcing hydrogen atoms into the holes of unsaturated fatty acids. This is done with hydrogen gas under pressure that is bubbled through the vegetable oil with the help of a metal catalyst, such as nickel, platinum or some other metal. When the hydrogen atoms combine with the carbon atoms, the oils becomes saturated or hardened. When this occurs, this new product (margarine) no longer resembles the original oil. Nickel is a toxic heavy metal and some amount will always remain in the margarine at it’s completion. To make this appeal to the masses, deodorants and coloring agents are added to disguise the rancid smell and to hide the disgusting grey color of the margarine. What remains is a highly artificial fat that contains trans-fatty acids and the same calorie count as butter. All the original essential fatty acids are now gone, and any semblance to nutrition has disappeared. The hydrogenated oils (and partially hydrogenated) in margarine are known to cause cancer, diabetes, heart disease, and much more. They block the body’s ability to absorb essential fatty acids, which are critical for every bodily function. And, if all that weren’t enough, they make you gain weight like crazy. Still think margarine is the healthier choice? It’s rich in important trace minerals, including chromium, manganese, copper, zinc, and selenium (a powerful antioxidant). And perhaps most surprising, butter is a good source of dietary cholesterol which helps protect the body from damage by free radicals found in things like vegetable oils and trans fats. First Choice: Butter made from the raw milk from grass fed, healthy cows (no antibiotics or growth hormones). Second Choice: Butter made from pasteurized milk instead of raw. Third Choice: Lastly (but still better than margarine) is conventionally made butter. 1 Response to Butter or Margarine?